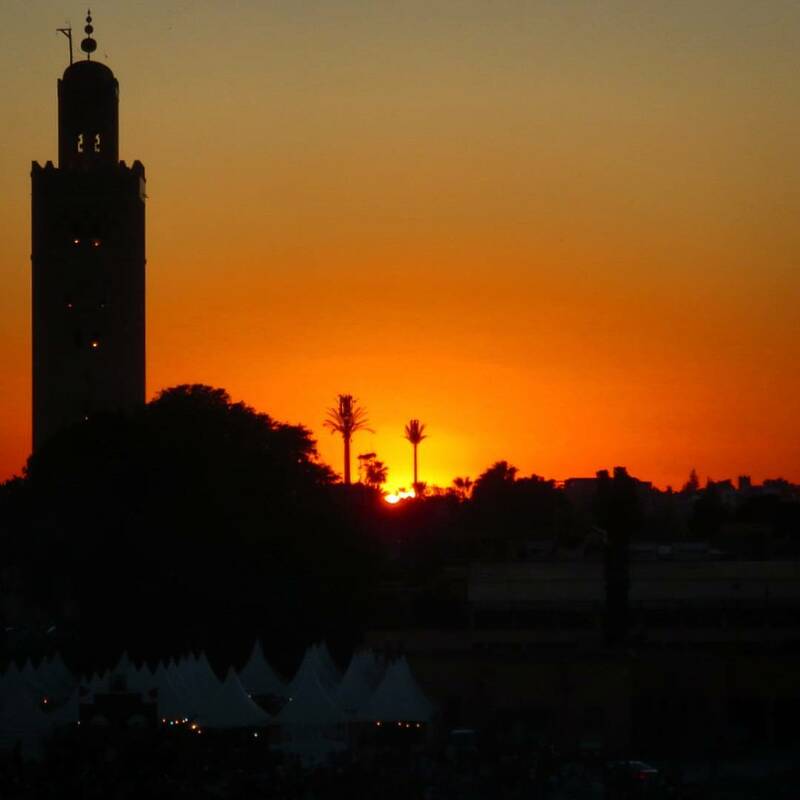 I was excited to visit Marrakech. 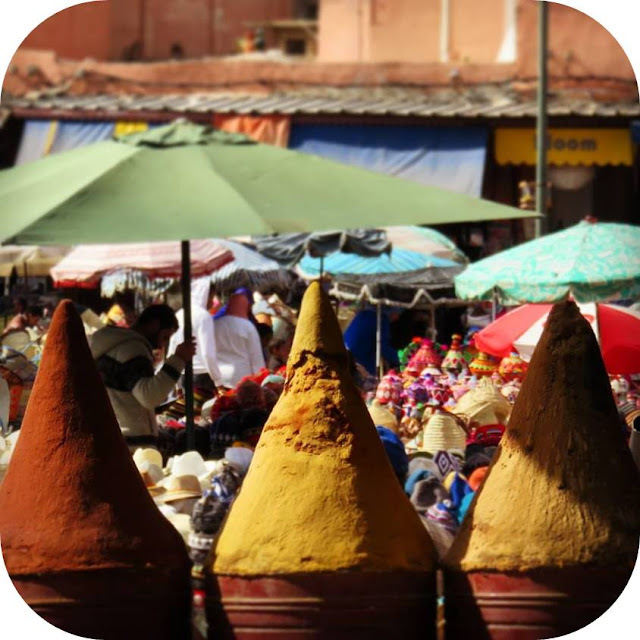 Morocco has been on our travel wish list ever since we moved to Ireland over five years ago. 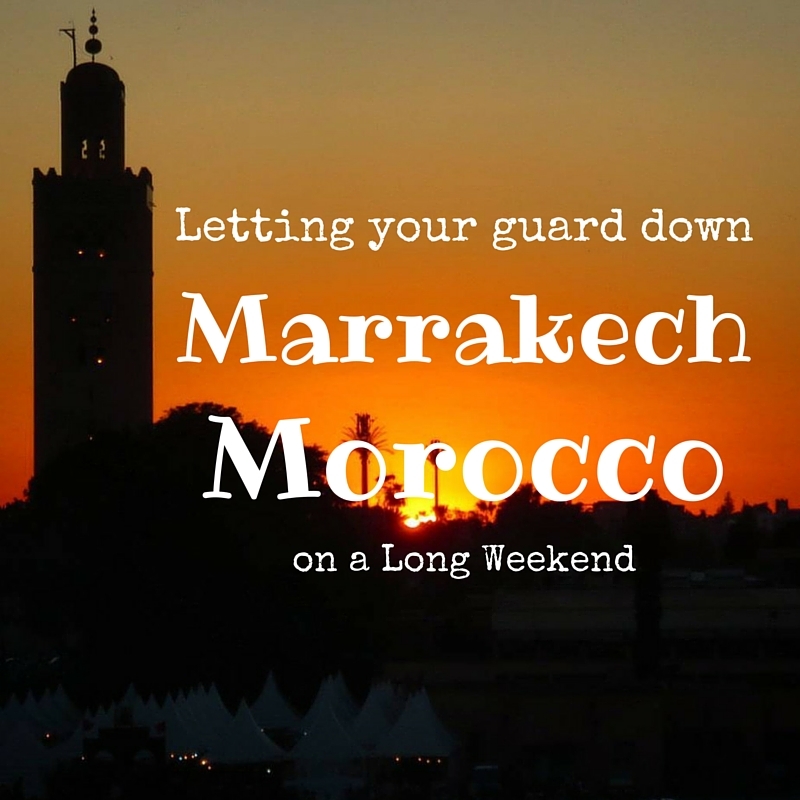 Now that Ryanair offers direct, low cost flights from Dublin, we had no more excuses not to go and booked ourselves a long weekend in Marrakech in January 2016. Reflecting on that weekend, I have mixed feelings about the trip. When I tried to summarize those feelings to one of my friends, she summed it up perfectly: "It sounds like there was some cool stuff to see but the place was exhausting in its scamminess." Exactly! We felt like we constantly needed to be on our guard from the moment we stepped off the plane. Still, there were moments on the trip when we let our guard down and were so glad that we did. I suppose we were even on our guard on the airplane itself. We had barely taken off when the lady sitting next to me offered me her bag of Mentos. Why not, I thought. Might as well make a friend on the 3.5 hour flight. I learned that Wafaa was Moroccan but currently living in Dublin. She was heading back for a brief respite and some comforts of home. The next thing I knew, our 'neighbors' in the row behind us started speaking to my new friend in Arabic. The soon started handing around sandwiches on traditional Lebanese bread. Of course, they offered some to us as well. My first reaction was to decline (who knows where the food came from and if it might cause my stomach to turn). I quickly resisted that urged and gladly accepted the treat. We got to talking and it turns out that the two were friends and doctors currently living in Dublin as well. 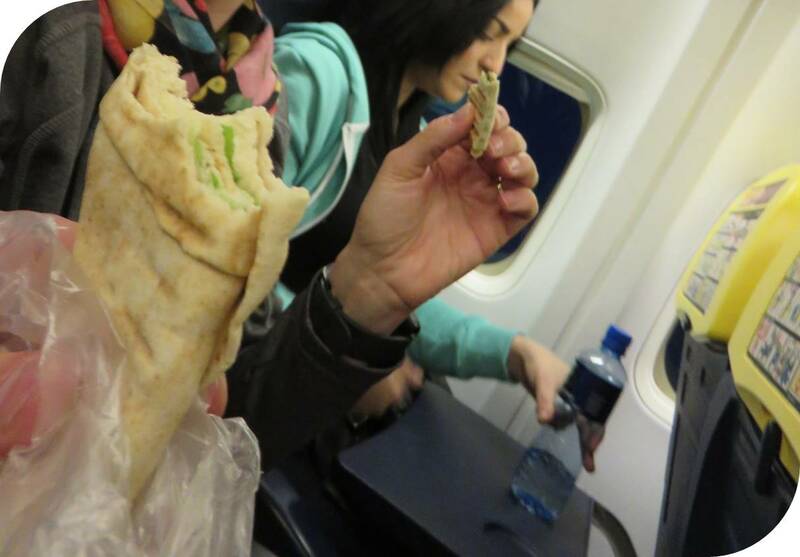 We had a lovely chat all because we let out guard down and were willing to break bread with strangers on a plane. Admire the Ornate Metal Doors but Mind the Traffic! Once we arrived in Marrakech, we took a quick walk to familiarize ourselves with the Medina. My eyes perked up when I started to spot ornately decorated doors. 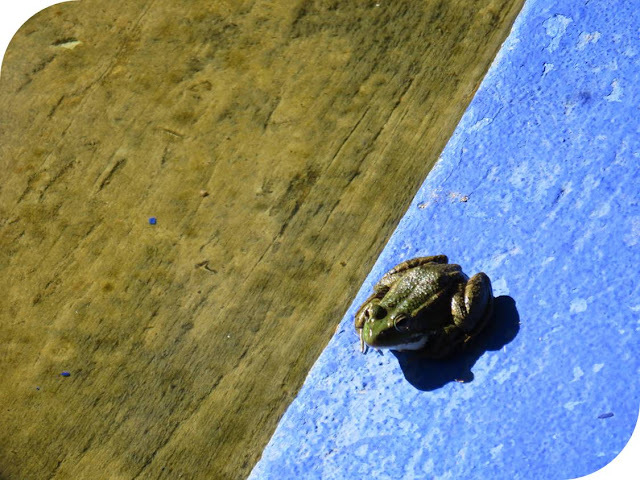 I was starting to let my guard down imagining all the photo opportunities that I would encounter. My guard immediately went back up when I was nearly run over by a passing motorcycle. Vehicle after vehicle whizzed past just inches away from us; everything from mopeds to bicycles, to donkey carts. 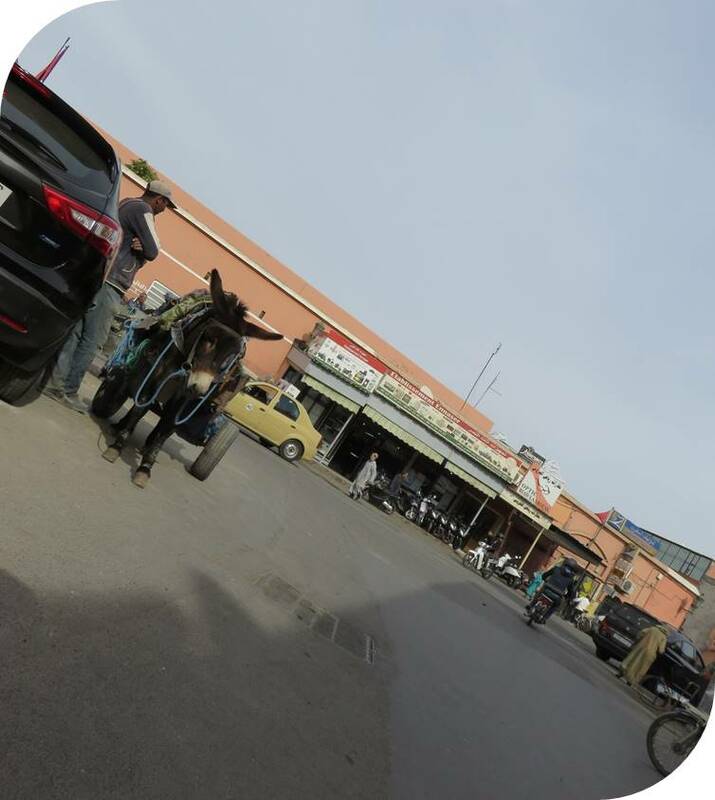 I'll admit, I found walking around the streets of Old Town Marrakech quite harrowing because of the unpredictable traffic. Riyadhs in Marrakech seem like the ultimate sanctuary. 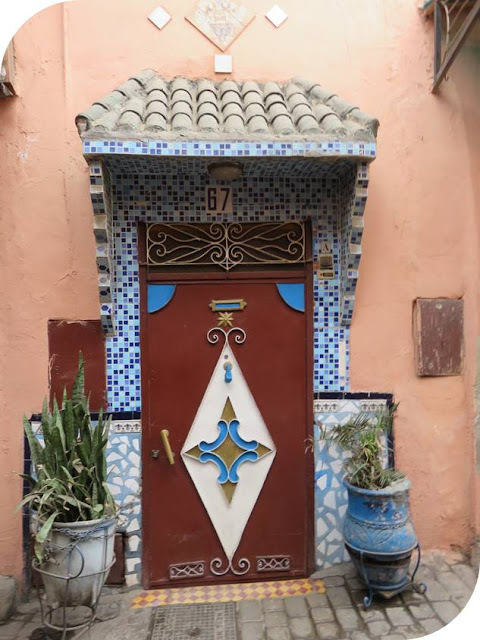 You rock up to an ornate door on a narrow street with the chaos of Morocco buzzing past all the while. As soon as you step inside though, all that ambient noise disappears and you have arrived in your oasis. This seemed like the perfect place to let our guard down. That is, until we tried out the hotel's free WiFi and learned that it was infected with a virus and tried to download a bunch of dodgy files to our phones. No thanks! Our guard was definitely back up. Is no place sacred? 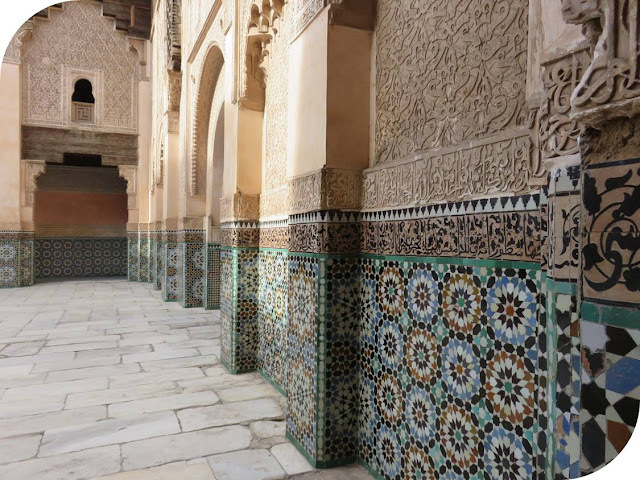 Medersa Ben Youssef, the old Islamic college in Marrakech is now a popular tourist attraction. 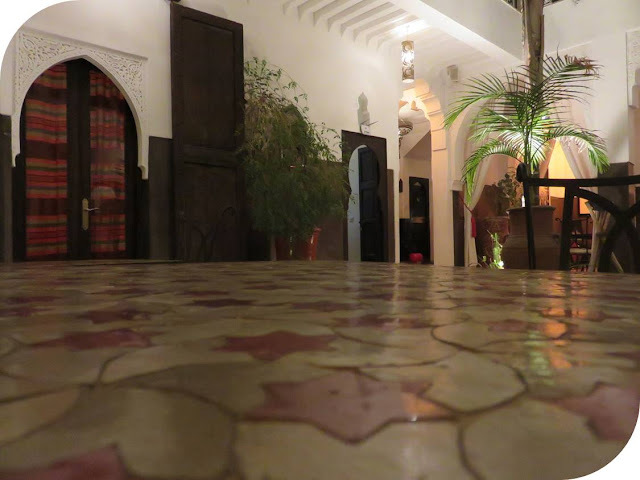 We wandered through the old halls of the school admiring the ornate and intricately patterned tiles. We had paid a cover price to enter the medersa so imagine our surprise when it became clear that we were expected to pay to use the toilets. This turned out to be true of pretty much every place that we visited. Bring small change or be prepared to be relieved of whatever denomination of coin that you happen to have. In use since the Middle Ages, the market square at Jemaa el-Fnaa clearly seemed like a place where we'd need to be on our guard. We were told not to make eye contact or take pictures of any of the snake charmers or other touts. If these saw us, they would aggressively ask for a tip. 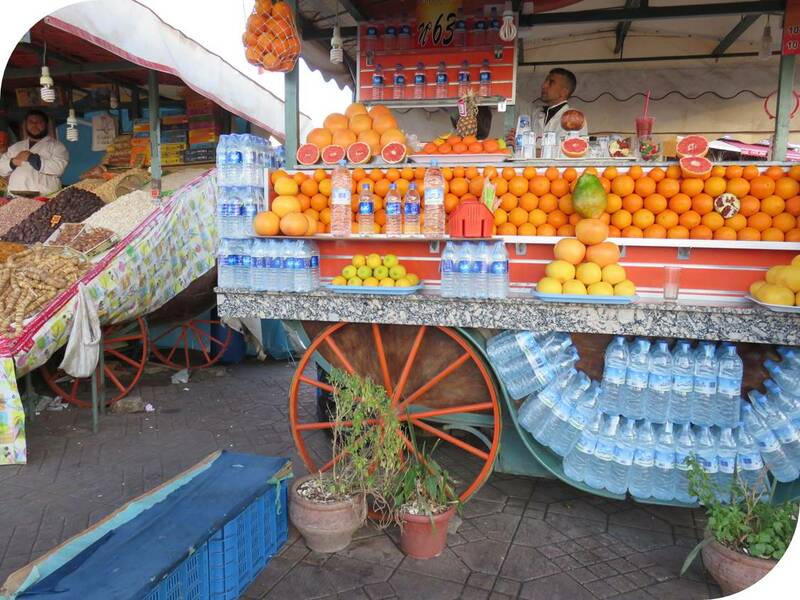 As we were averting our eyes from the craziness around us, our eyes fell upon a particular orange juice stall (there are many, many orange juice stalls on the square). We decided to let our guard down (mostly) and try a glass of fresh squeezed orange juice (in a plastic cup to avoid contamination with the local water). It was the freshest, most delicious glass of juice I've had in a long, long time. Jemaa el-Fnaa may be absolutely crazy, but we found we could let our guard down a bit when we got above it all. There are a number of cafes lining the square. We climbed up to the balcony level of Cafe de France. At first, all the tables along the railing overlooking the square were taken. However, I was ever vigilant and as soon as a couple rose from their seats, I sprang into action and snagged the table. Never hesitate! 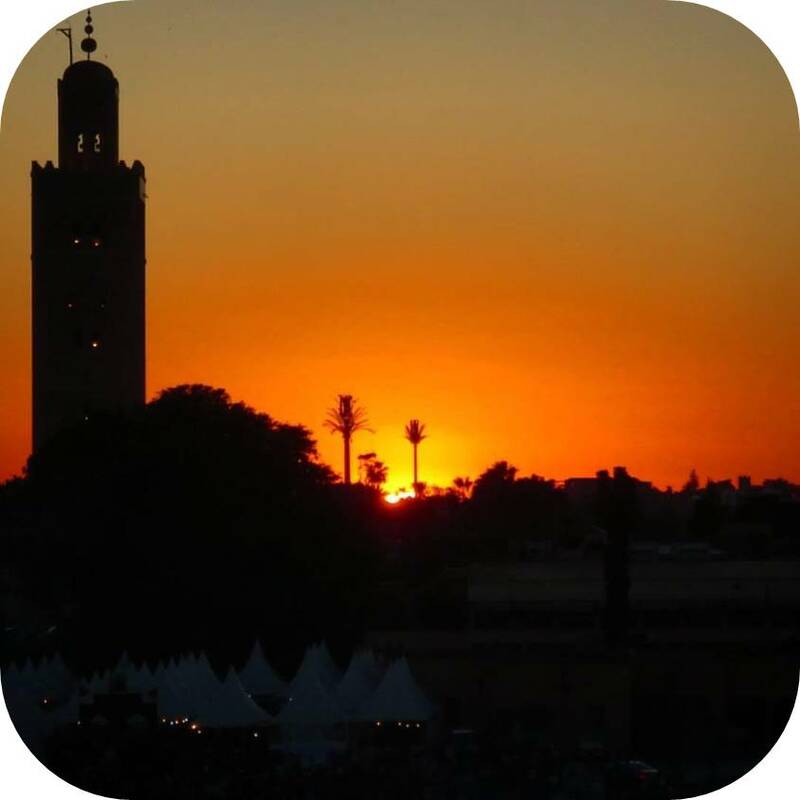 We were rewarded with stunning sunset views and the perfect vantage point over the sights and sounds of the square below. The souks in the medina are another exhausting experienced. We found that we needed to be on our guard and particularly covert in our shopping. If anyone saw us even pause or look in their direction, they were all over us offering to sell us goods at 'rock bottom' prices (prices that were in reality inflated 2-5x above market value for naive foreigners). 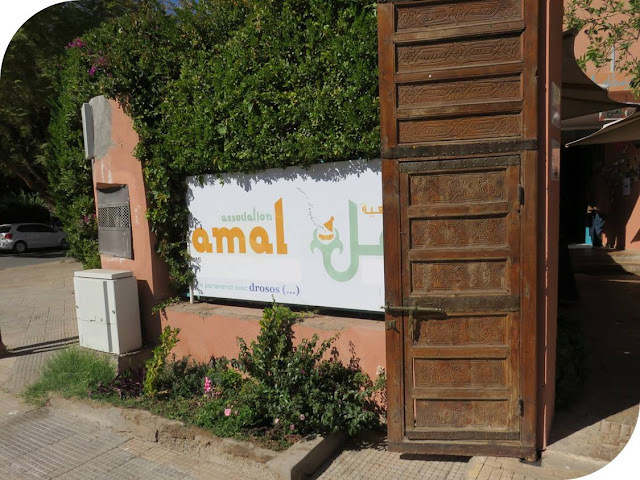 We also found that as we were walking through the souks, 'helpful' locals would tell us we were going the wrong way (even though it was clear from our map that we were going the right way). I'm not sure what the incentive was for people to give us incorrect directions; perhaps they would lead us past a favored uncle's stall. Regardless, we felt the need to constantly be on our guard and like we didn't have a safety net of helpful locals if we got lost. Despite how stressful the markets seemed, I did let my guard down once or twice to shop for some Moroccan scarves. The vendor was seemingly friendly and I was able to negotiate an acceptable price. I still probably overpaid, but at least I felt like he was willing to negotiate. I love those scarves too so it was worth it. What could be more relaxing that a traditional Moroccan bath (hammam)? It turns out that we really needed to be on our guard in getting to the spa. It was located down a winding side alley. As we peeled off the main street onto the alley, a small boy started asking us if we were looking for the spa. He proceeded to walk with us despite our very best efforts to ignore him and as soon as we arrived in front of the spa, he started demanding a tip. 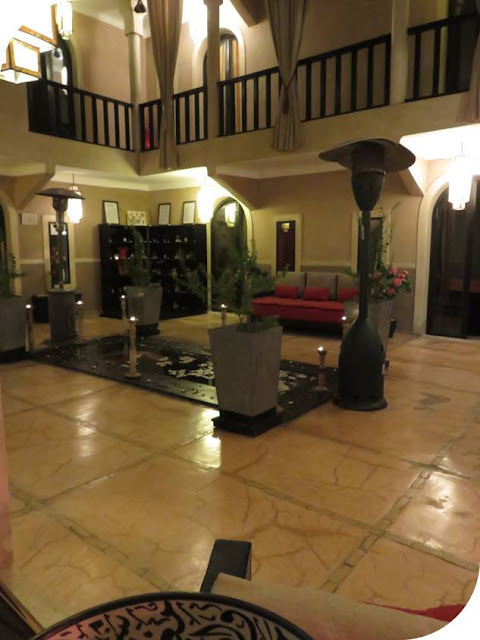 The spa manager shooed him away and ushered us inside. I'll admit, I felt more than a bit on my guard stripping down in front of the spa attendant. She proceeded to scrub me with a vengeance using traditional Moroccan black soap and extremely hot water. I could actually see layers of skin sloughing off as part of the treatment. I decided to just go with it though...No need to be alarmed. I'm really glad I did. My skin felt soft and glowing afterward. 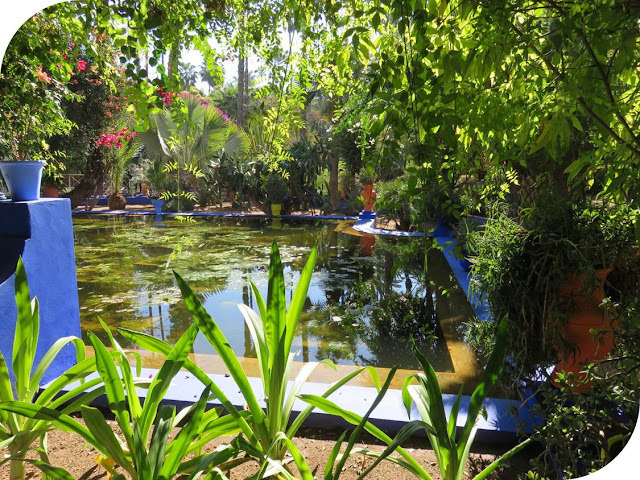 We ventured beyond the walls of the Medina in Marrakech for a day trip to Ourika Valley. Great!, we thought...we'll definitely be able to let our guard down outside of the city. That feeling quickly faded when our driver rear-ended someone before we'd even emerged from the Medina walls! The feeling of being on our guard continued. It was a private tour and the driver asked us if we wanted to stop at a traditional Berber Village. 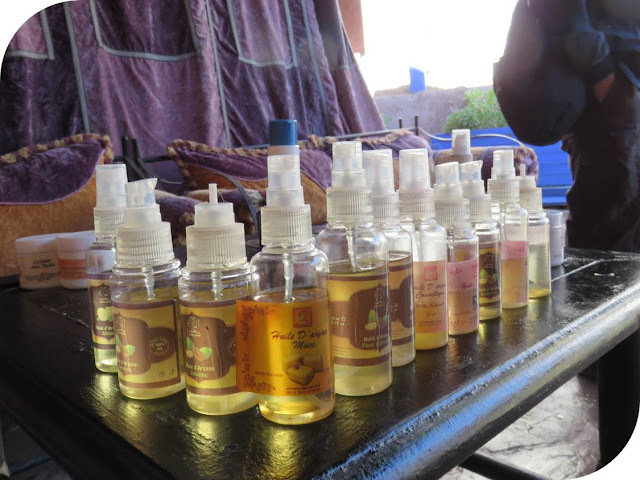 How about a nice Argan oil shop? Concerns immediately started swirling through my head: Is this a scam? Is he going to take us there and then force us to buy stuff at ridiculous prices? Maybe this is actually part of the tour? We felt so confused and conflicted. In the end, we opted to stop at an Argan oil producer. It turns out that it was definitely set up for tourists but we got to see the women making the products (and take a picture with them for a small tip). We were even able to shop in an unharrassed fashion. In return, I purchased a small bottle of lemon scented oil believed to help with wrinkles. 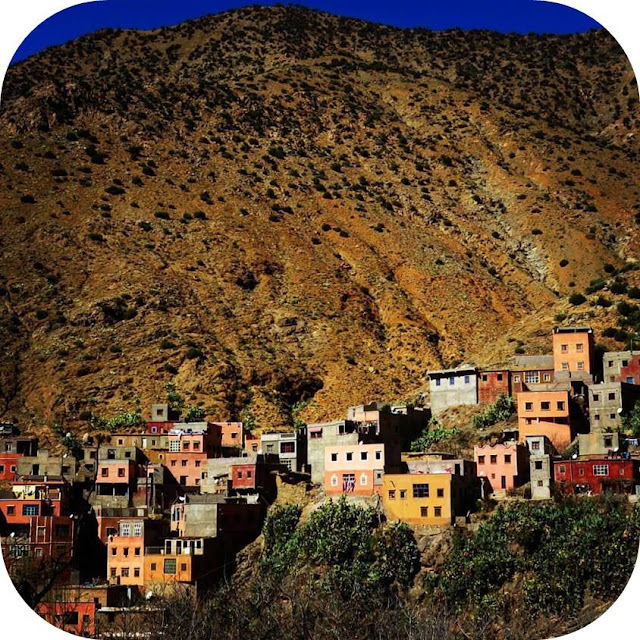 We soon arrived in Setti-Fatma, a Berber Village in the Ourika Valley. Our goal was to check out the waterfalls nearby. We'd been warned not to negotiate for a guide with our driver as we would very likely be overcharged. How hard could it be to find the cascades? We walked up and down the road along the riverbed looking for the trail to the falls. We had arrived quite early and there was no stream of people headed in that direction so we remained stumped. 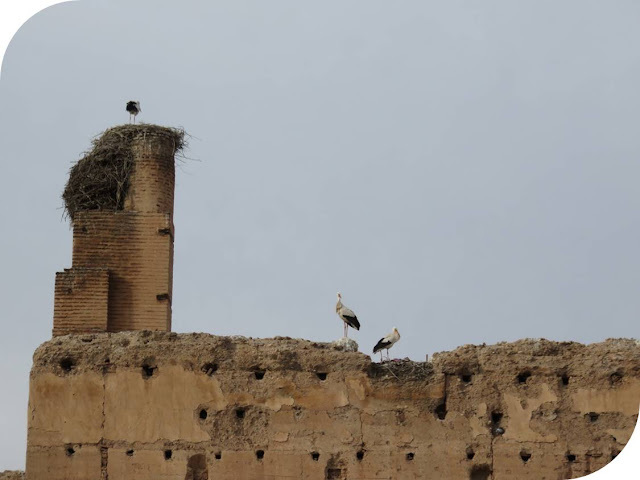 A friendly Berber man made an initial overture and offered to take us to the falls. We politely declined. Walking up and down the road one more time, he made a second pass, this time offering an even lower price. Given that we had no idea where we were going and were starting to get frustrated, we stopped to listen to what we had to say. In the end, we negotiated for him to take us to the first waterfall for the equivalent of about $5 USD. All the way up, we kept thinking, there must be some strings attached. He's going to ask us for more money at the top. There has to be a catch. We got acquainted along the trail and learned that our guide's name was Ihimmi El Houssami Ben Mohamed, a Berber who had spent his entire life in this valley. As we ascended the trail, the path got even more treacherous. Ihimmi was soon holding my hand and helping me up the rocks. 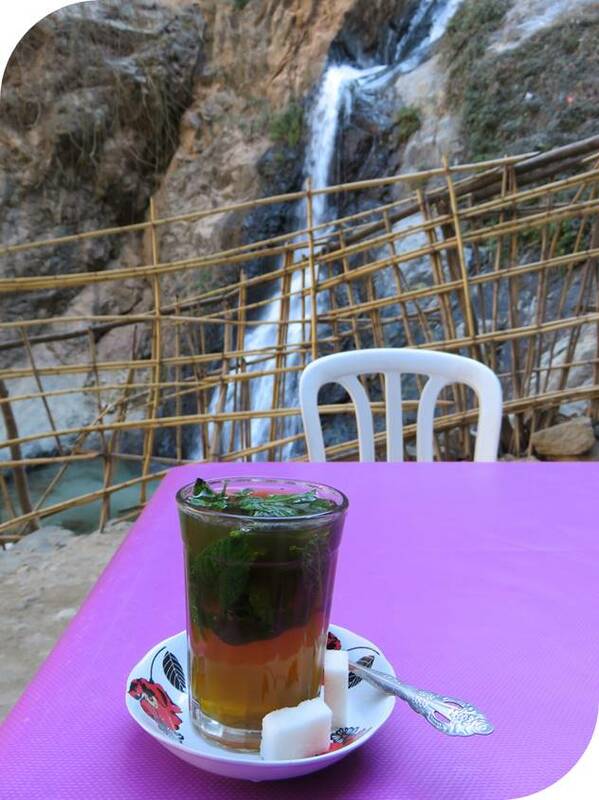 We eventually emerged at a small cafe selling tea in view of the waterfall. We paid Ihimmi and he didn't ask for a penny more than what we agreed. Given how much he helped us on the climb, we did give him a sizable tip; effectively doubling his fee. Now that we knew the way, we expected to climb down on our own. Ihimmi insisted on staying with us. He walked with us down the hill; retracing our steps over the treacherous trail. We stopped in a small village on the way down where they were selling crafts. A long rope necklace made of colorful beads caught my eye. Immediately, my guard went up again when the vendor offered me a price equivalent to about $75 USD. No way! That was a complete tourist rip off price. After some friendly negotiation and threatening to walk away empty handed a few times, we ended up settling on a price about equivalent to $15 USD. I still probably overpaid but I felt better that I'd gotten a price I could live with and I simply love that necklace. 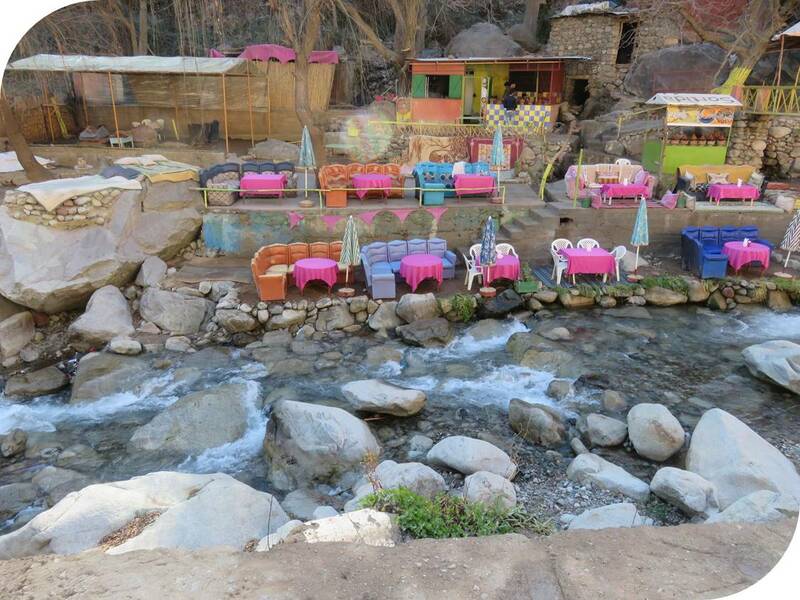 It always makes me think of this trip and hiking up to the cascades in Ourika Valley with Ihimmi. One of the most charming aspects of the Ourika Valley and Setti-Fatma is the outdoor restaurants selling tagines set-up along (or sometimes in!) the river. This looked like an ideal spot to relax in the sun and grab some lunch. We paced up and down the road, on our guard. How could we be sure that the restaurant that our driver picked out was not going to rip us off. We compared prices at a number of places along the way and felt reassured that the prices were all pretty similar. When we got back to the spot where we had left our driver to go on our hike, we found that the prices were indeed competitive. We staked out a table along the water and enjoyed our tagine in the sun. 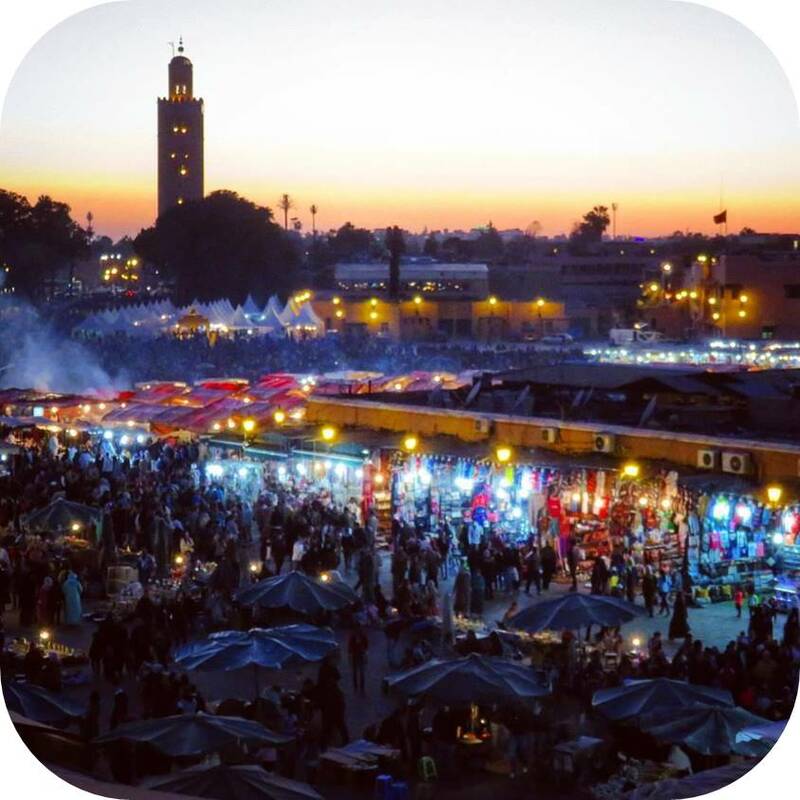 Countless street food vendors set up on Jemaa el-Fnaa each night selling meat skewers and tagines. My guard always naturally goes up when it comes to street food in developing countries. Multiply that 100 fold when the touts start telling you that only their stall is guaranteed not to give you diarrhea! We perused the stalls, trying to find the freshest, cleanest looking place. Despite our reservations, Morocco is known for having some top street food and we wanted to give it a try. We made sure to use hand sanitizer on both our hands and the utensils. 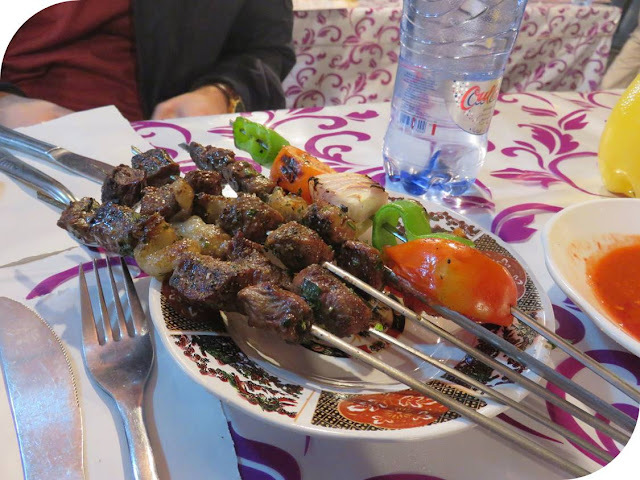 We soon tucked into some delicious skewers and a tagine. We were feeling sated and our guard was on the way down again when we got the bill. Suddenly, our guard was up again. We ordered a tagine with meat and apricots. That's what the vendor offered us but apparently it has a 'special price' and is not exactly what's on the menu. 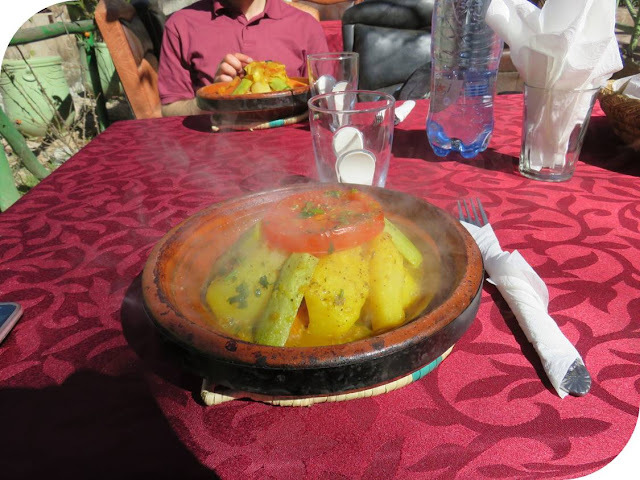 We ended up being charged nearly doubly what we thought that tagine would cost. In the end, that street food meal was not a particularly good bargain. It was worth trying for the experience but left a somewhat bad taste in our mouth (figuratively). 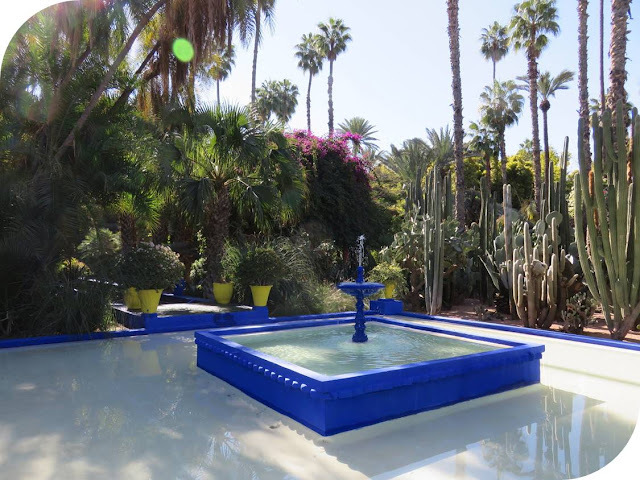 On our last day in Marrakech, we stopped at Jardin Marjorelle. Our guard definitely went up when we realized that foreigners were being charged nearly 10x the entry fee that locals are charged. I quickly got over it though as this is not the first time I've seen this phenomenon (India always comes to mind when it comes to this practice). We went inside and had a lovely time watching the frogs and wee turtles in the fountain in the center of the gardens. It was a relaxing respite from the hectic pace of the Medina. 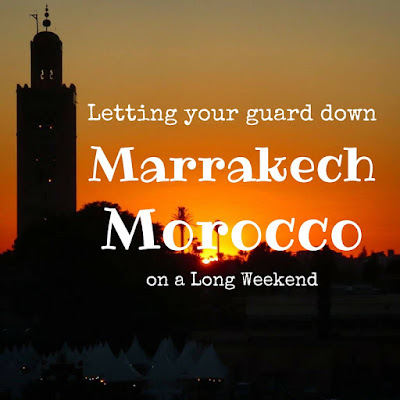 Explore Marrakech, Morocco and find out why you need to be on your guard but also be willing to let your guard down (sometimes) on a long weekend trip. 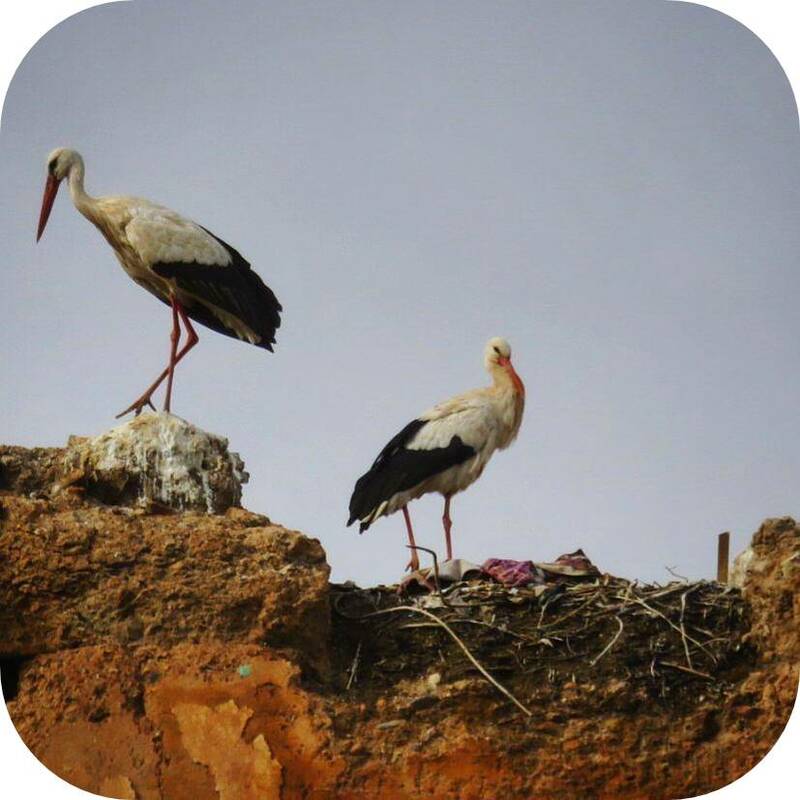 Written by travelblogger Jennifer (aka Dr. J) from Sidewalk Safari.